A broadly oval tree. New foliage is a showy bright red, turning to a lustrous dark bronze-green as it matures. Fall color is bronze. It is easily grown in average, medium moisture, well-drained soil. It prefers full sun. 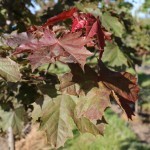 Norway Maples are tolerant of a wide range of soils, heat, drought, and urban conditions. It is a seedling of 'Schwedleri' and was discovered in British Columbia.